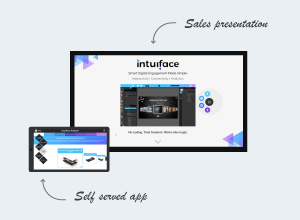 Here we talk about the three charts you should use in every digital signage analytics project. The first two will help you measure the effectiveness of your deployment. The third will shine a light on your most important measures. Will measuring stuff help you run your business? Of course you should measure!!! We all know that, no one would argue otherwise. Any business owner would be nuts not to. What can really be said about a business without analytics? 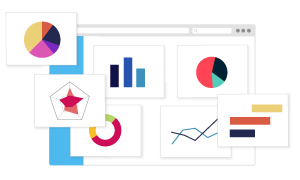 If you understand how important analytics is to running a business, why wouldn't you use analytics to help you run a project? You would right? The reasons are exactly the same. You only know what you can measure so every project would benefit from measurement and the corresponding insight. And yet, focusing on the world of digital signage, very few projects have an analytics component. How are decisions being made? By instinct! By the same crazy approaches we knew were crazy when talking about running a business. Why would we do this to ourselves? There are three key reasons most digital signage projects lack analytics. Lack of mind share because there is no history of using analytics on a project. Lack of experience or confidence in executing an analytics initiative well. As I like to say to my son, reasons aren't excuses. However, knowing the reason provides you with a guidepost for making things better. And frankly, the first two reasons are easily corrected. No experience or confidence? Ok, now that's a good one. No shame there and it's not your fault. We've established that analytics is atypical for individual projects, so your lack of knowledge is collateral damage. Of course, the solution is education - but where to start? One must be very careful about reaching inappropriate conclusions when studying collected data. First, there's the old saw that correlation does not mean causation. 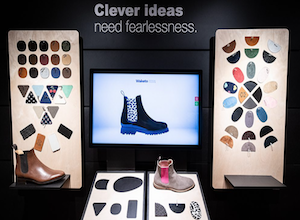 If in-store revenue goes up when winter settles in, does that mean cold weather causes people to buy more? A more sensible explanation is that Christmas and New Years is the cause. Be careful about inferences. Second, be careful what you wish for. If you're hoping for particular outcomes, you may view data with rose-colored glasses and reach inappropriate conclusions. If a particular set of items is never viewed on an endless aisle kiosk, is it because those items are not popular? Or is it possible that the kiosk design makes it hard to discover or understand that category of items, so no one decides to view them? Let's talk about the three charts you should use in every digital signage analytics project. The first two will help you measure the effectiveness of your deployment. The third will shine a light on your most important measures. Average Dwell Time is an unvarnished measure with clear implications. With this number, you can unambiguously identify the level of engagement your signage content is achieving, and do this on a screen-by-screen basis. Dwell time is the amount of time a person (or people) is actively interacting with your content. 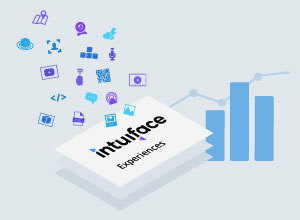 The interaction could be explicit, like tapping buttons or entering information in forms. But interaction could be implicit as well, like watching a video. Either way, dwell time tells you how long a given user has engaged with your content. 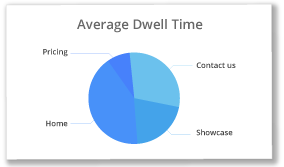 Average dwell time gives you an overall view of how engaging a given screen has been. The timeline is up to you - hourly, daily, weekly. And the focus could be at any comparative live - per screen, per floor, per geographic location, and more. During your signage pilot phase, establish a dwell time baseline. What is the average across all locations, all screens, over a given time? Then, beyond the pilot, track average dwell time and compare it to the baseline. Average dwell time is the perfect way to identify the engagement level of your content. Changing content, or location, or format, or many other aspects of your deployment will likely alter the average, an ideal moment for running A/B tests to identify methods for improving engagement. It's an indispensable measure. If you know anything about website analytics then you're familiar with the notion of a session. A session is the set of actions performed by a unique visitor. Each visitor is represented by a unique session. The more sessions, the more people. 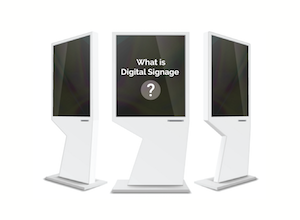 The more people, the more engagement your signage deployment is delivering. There's a catch here and that's how to identify a session. With websites, session identification is easy. Every device has a unique IP address, and Web servers (and Google) can see these IP addresses. Each IP address is a new user and thus a new session. Google takes this even one step further and will treat multiple sessions from the same IP address as one session if they happen in close succession. Automatically returning to the home screen after a set amount of time during which no interaction has occurred. It's likely that the next interaction is a new person. Adding a Home button. A tap of this button likely indicates a new person has begun their interaction. Adding a Start button. As with the Home button, a tap is a good indication that someone new is at the screen. These approaches aren't foolproof, but there's a good 80/20 (if not more) chance of accuracy. By measuring session count - which, like average dwell time, can be based upon any particular timeline or environmental contingency like location - you'll know (almost) exactly how many people have interacted with your content. There is no ambiguity about what this number means; you have to decide what your target should be. More A/B testing could reveal approaches that would increase usage. The hardest part of any analytics endeavor is identification of the key measures that are meaningful and actionable. 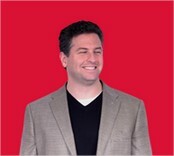 Your goal should be to avoid MURs: measurable but useless metrics. We've just listed what we believe are two of the most important metrics you should collect (average dwell time, session count) but there are certainly many other useful measures unique to your needs and your deployments. A formal exercise involving stakeholders should be conducted to identify these Key Performance Indicators, or KPIs. It's a skill that will improve with time. Regardless of what those KPIs are, it's almost guaranteed that they'll have a goal. The goal could be a specific number or a trend which - in either case - may be more or less than the current KPI value. To ensure sufficient clarity about progress, favor the use of Single Value Charts. 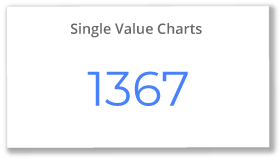 Single Value Charts are comprised of a measure and the change experienced by that measure since the previous time period. For example, your Average Dwell Time chart could this week's average dwell time and indicate that this time is 30% more than the average time recorded during the prior week. 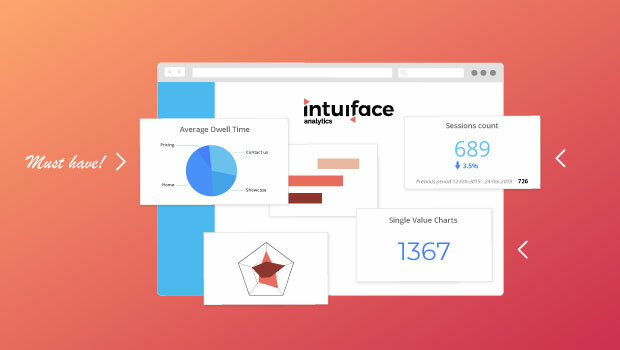 Notice how Single Value Charts make it simple for any consumer of your analytics dashboard to know what values matter. Yes, you could use visuals like line and bar charts, but they're harder to consume in a single glance. Values in these more involved charts are hard to discern, and percent changes are not obvious. Detailed charts are critical for successful analytics exercises. Thus the consumer for such charts is the analysis team, not necessarily the stakeholders. High-level project owners need to know project health and progress at a glance. Single value charts will do that. If there is a desire to go deeper, then you have lots of other charts to show them. Look, you should be using analytics on your signage products. Without them, you're walking through a dark room without a flashlight. You won't know where you are or how to get where you're going. It's hard to know where to start so we've given you three options for beginning your journey. 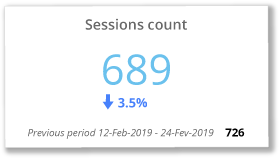 The first two - average dwell time and session count - will give you a clear understanding of content effectiveness and clear indicators, over time, of how well you're improving that effectiveness. The third option, single value charts, are a framework for simplifying the display of your Key Process Indicators. They deliver at a glance. If you want to learn something, you need to start with the basics. Wade into the pool before diving into the deep end. We hope this article has given you a good place to start.